Students will be awarded certificates when they've completed each level and passed their examinations. A great variety of materials & equipment, including audio-visual materials & equipment, are used in teaching in order to make the classes as interesting as possible. L . A . teaches students to speak accurate, fluent English in a variety of situations and prepares students for standardized tests ( like the TOEFL ). Learning is easier, faster and more interesting at L . A . because of the unique, efficient methods of teaching, comfortable, air-conditioned classroom, modern equipment, and pleasant environment. 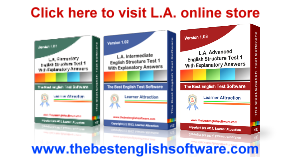 You can improve your English by watching these videos.